^ a b c Marsden, Sam (18 November 2012). "Agatha Christie's The Mousetrap celebrates its 60th anniversary with star-studded show". The Daily Telegraph. London. Retrieved 19 November 2012. ^ Masters, Tim (25 November 2011). 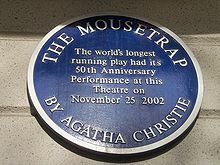 "The Mousetrap to tour for 60th anniversary". BBC News. London. Retrieved 13 December 2013. ^ Leach, Ben (29 August 2010). "Agatha Christie's family criticise Wikipedia for revealing Mousetrap ending". Daily Telegraph. Retrieved 20 October 2010. ^ "Lifting the lid on spoilers". BBC News. Retrieved 19 August 2016.